Thank you! You may now download all the Harvest for Healthy Kids activity kits! 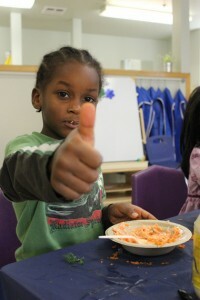 Children in Natalie Stemler’s Head Start class gave a thumbs-up to carrot salad they made with local carrots Oct. 18 to celebrate National Farm-to-Preschool Day. The activity was part of the Harvest for Healthy Kids program, a partnership between Portland State University and Mt. Hood Community College Head Start. Children have been shown to like more fruits and vegetables after participating in the program, which features one fruit or vegetable each month — carrots for October — in Head Start meals and classroom activities. 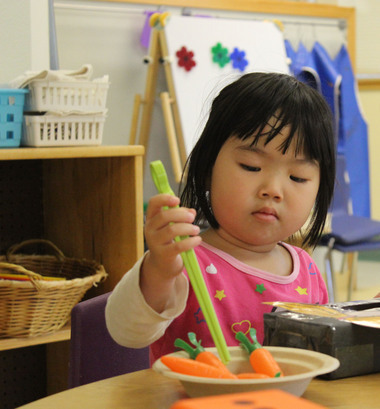 Children in Stemler’s Head Start class talk about where and how food grows, read books, play games and create art with or inspired by the featured vegetables. Stemler uses verbal praise, hand stamps and sticker charts to encourage children to try the fresh food. Betty Izumi, an assistant professor in PSU’s School of Community Health, said most children in the U.S. do not meet dietary recommendations for fruits and vegetables, which are an important part of a balanced and healthy diet. Poor diets are associated with obesity and other chronic diseases such as Type 2 diabetes. Izumi and Dawn Barberis, of Mt. Hood Community College Head Start, head the Harvest for Healthy Kids program with funding from Kaiser Permanente Northwest and Meyer Memorial Trust. It is aligned with the state’s early learning standards and aims to increase fruit and vegetable intake among preschoolers and promote Oregon agriculture. Head Start is the largest federally funded early childhood education program for low-income preschoolers. Farm-to-Preschool Day is a national celebration of connections between children and local food. In addition to making and tasting carrot salad, Stemler’s class played a game with small plastic carrots. Next up for November: squash. “The kids had a sample taste test and are really excited to dive into squash,” Stemler said. © 2014. Copyright Harvest For Healthy Kids. All Rights Reserved. Website designed by Big Whistle Studios.